First things first, thank you to Hachette Audio for the audiobook copy of ‘Chasing Embers’ in exchange for an honest review. Colin Mace has quickly become one of my favorite narrators and I will not hesitate to pick up a title with his name attached to it. I first found him when listening to The Court of Broken Knives by Anna Smith Spark and then with Blackwing by Ed McDonald, both superb books made even better by his voice. Needless to say, he did the same with Ben Garston in ‘Chasing Embers’. Ben Garston. Nice guy, maybe a little salty. He just wants to get away from everything and have a few fingers of Jack Daniels to drown his sorrows away. Good news for him is that he found a bar in which to do that; bad news is that a man with whom he is acquainted has just walked into said bar and put a claymore to Ben’s neck. Not quite what he had planned for the evening. You see, Ben (known for centuries as “Red Ben”) is a dragon. You could’ve probably figured that out from the book cover, synopsis, or just reading the first few pages (so not spoilery). Lucky for him (I guess? ), he can walk the streets in human form instead of as a dragon which leads to a fairly normal life. He and all of the other mythical creatures in the world are bound by a pact to hide their magical existence from mortals, you know, so chaos doesn’t ensue and everyone can live peacefully. There are even knights put in place to guard over them and to make sure everything stays peachy. Now, things aren’t so happy-go-lucky. The pact is broken, someone or something wants Ben dead, and an unknown force is makings winds out of the Middle East. Ben, being the last of his kind, must get to the bottom of the disturbance while also attempting to save the love of his life. 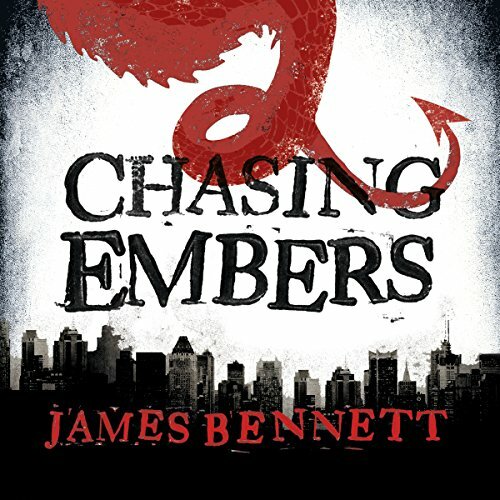 With Chasing Embers being Bennett’s fantasy debut, I wasn’t really sure what I was getting myself into. I have to say that I was pleasantly surprised by his writing and am definitely looking forward to continuing this series. There is a ton going on in this novel, including quite a bit of Lore and Egyptian Mythology that do enhance the experience, but can definitely bog down the reader. I feel as though Bennett may have done a little too much to push all of the world-building and history out in such a short novel, but it gives me a heightened sense of anticipation for ‘Raising Fire’ since he has my interest and the plot can further develop. Chasing Embers is perfect for fans of The Iron Druid Chronicles by Kevin Hearne, Paternus by Dyrk Ashton, or the Fables comics by Bill Willingham. It is Urban Fantasy at its finest and I highly recommend giving Bennett’s novel a shot.